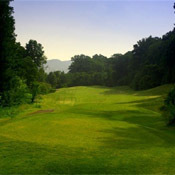 Golfers have long enjoyed playing Tennessee Centennial Golf Course - the Knoxville area's premier public golf course. Since 1997, the 6,633-yard layout has provided a fun and challenging golf experience for players of all abilities. Hole 1 Crafted by architect Gary Roger Baird, Centennial takes golfers through natural forests and rolling hills of Oak Ridge, presenting a championship layout with plush Bermuda fairways and Bentgrass greens. Centennial is enrolled in Audubon International's Cooperative Sanctuary Program for Golf Courses to ensure that the course helps to protect our local environment, conserve natural resources, and provide wildlife habitats.